Boxing Day is celebrated on the day after Christmas in Great Britain and most areas settled by the English including Canada, Australia, and New Zealand. The U.S. is the major exception. Some might say it’s the day when we pick up the boxes and wrappings from the day before, or return unwanted Christmas presents, though that’s not quite right. Apparently the holiday developed in the Middle Ages because servants were required to work on Christmas Day, and they took the following day off. As the servants prepared to leave to visit their families, their superiors or employers would present them with a “Christmas box” containing gifts, bonuses, and leftover food. As time went by, Boxing Day gift-giving expanded from presents for servants and charity to the poor. The alms-giving tradition has always been closely associated with the Christmas season – hence the canned-food drives and Salvation Army bell ringers – and an “Alms Box” was typically placed in every church on Christmas Day, into which worshippers left a gift for the poor of the parish. The contents of the alms box would then be distributed on the day after Christmas, which could be why that day became known as Boxing Day. Today, we have a whole new reason to celebrate Boxing Day. If you have a pile of empty boxes sitting under the Christmas tree, and your recycling container is full, it may be time to do something else with all that cardboard. 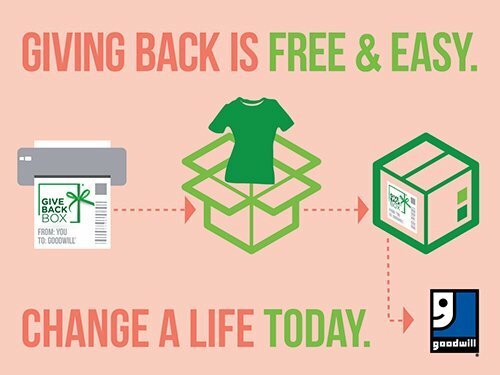 Give Back Box is a feel-good solution that will not only help you with your box problem, it also helps you to get rid of unwanted stuff in your house and deliver it to those in need. Give Back Box is a service that aims to provide people with a simple, convenient way to donate household items to charity, while also addressing the issue of cardboard box waste. You can use a partner box (such as one from Amazon Prime or Newegg), or any old box you have lying around. Fill it with clothing or household items,* print out a prepaid shipping label from the Give Back Box website, and then you can mail your box to the nearest Goodwill free of charge. When you donate to Goodwill through Give Back Box, you support participating Goodwill 501(c)3 nonprofit agencies. Goodwill stocks its shelves with the donations, and the revenues help fund its mission of creating jobs, helping people in need, and enriching the local community. Goodwill also recycles every box that arrives at its facilities. *No electronics or hazardous items may be donated through Give Back Box, but there is no limit on how much you can put into a box or how many boxes you can send. So, stuff the box to the brim and send as many as you want. The postage is always free! This entry was posted in 000 General Information and tagged Amazon Prime, Boxing Day, charity, Christmas, Give Back Box, Goodwill. Bookmark the permalink.